Cambodia has really turned out to be a surprise. When I would think of Cambodia, I would think of starving people, a brutal genocide, and maybe some rainforest. Certainly all of this is true, but that is only what Cambodia is outwardly. Once here, we’ve seen a totally different place. The people here are the friendliest and kindest people, always eager to help out a dumb foreigner and show us true hospitality. One of the really interesting ways that this shows itself is in the traffic. While traffic in Bangkok was a nightmare, in Cambodia everyone seems to work together. Let’s say you are trying to pass someone on a two-lane road. You go into oncoming traffic to pass them and the front car will move into the shoulder to give you more room. It’s an extremely efficient and cooperative method that only comes from the kindness of others. 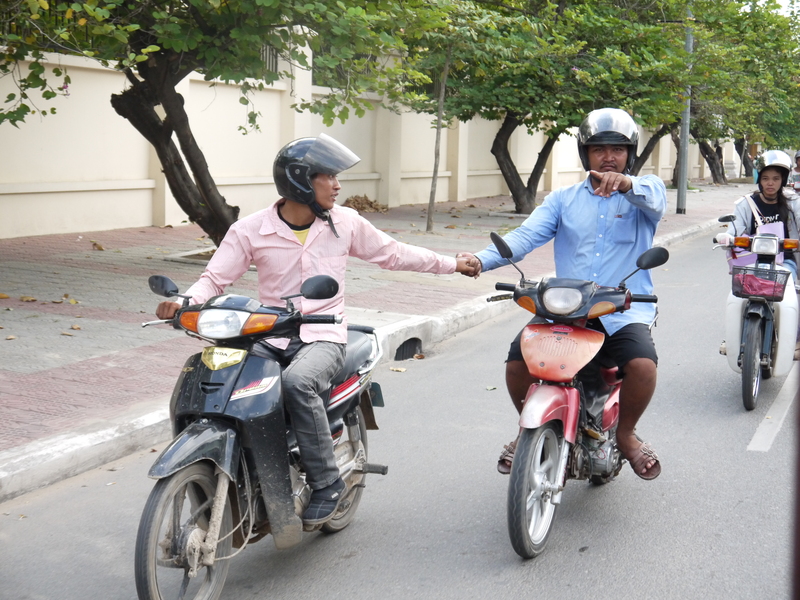 We saw this kindness first hand when we took a bike ride through Siem Reap before leaving that afternoon. We pedaled through the town and headed to the outskirts, passing by farms, a hundred stray dogs, and even some locals setting up for a wedding ceremony. We briefly stopped by a man’s small house where he made rice wine in his yard when one of the girls felt ill. It turned out her bike had a flat tire and she had been pushing right on through. When our group went to the neighbors house, she poured us all coconut juice from the coconuts from the palm trees in her backyard! 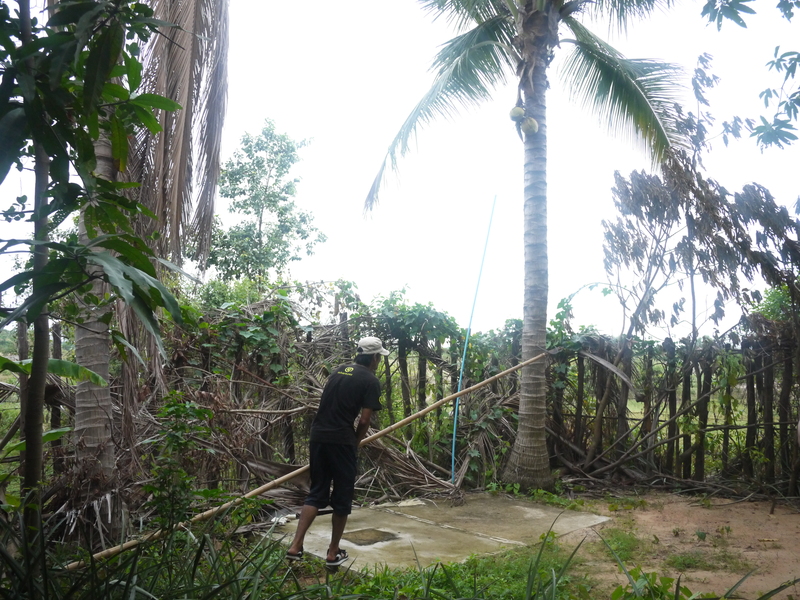 Our guide Kim using a giant bamboo scythe to cut down a coconut. Upon returning, we made our way to the capital city of Phnom Penh on a public bus. This was not nearly as scary as it sounded (or I’m sure will be in the future). They played American movies with no sound and Cambodian subtitles and I had plenty of leg room! We hit a little bit of traffic so we didn’t finish our 6 hour bus ride into Phnom Penh until about 7PM. Our hotel, however, was right on the main hot spot of Phnom Penh, the riverside boardwalk. The Mekong River shimmered at night, surely reflecting the touristy restaurant street lights off of the polluted water. That night, when I got back to the hotel room, there was a gecko waiting for me behind the door… fun. 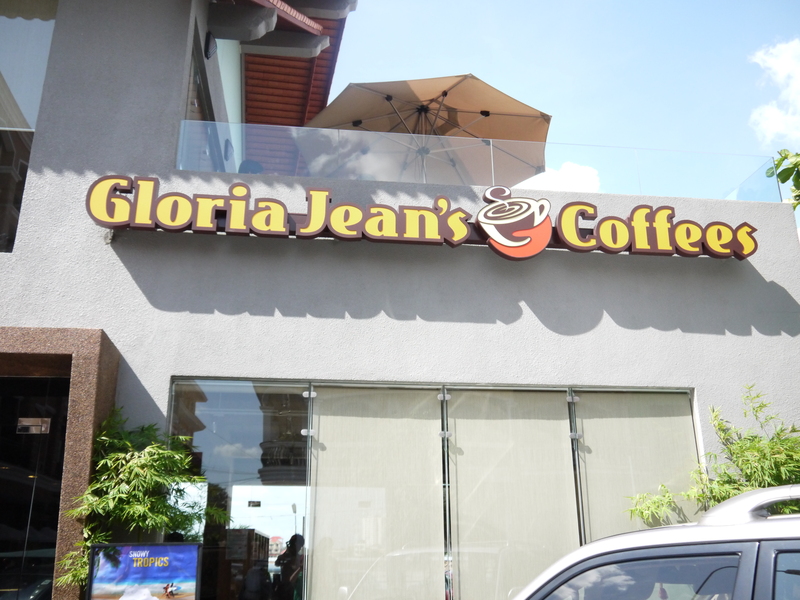 Little old Gloria Jean’s is apparently a sensation in Cambodia. 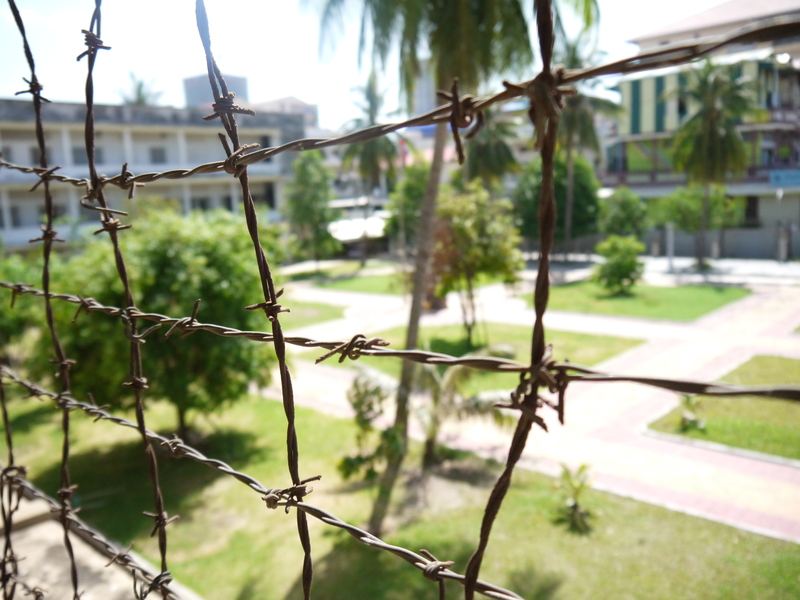 Behind the barbed wire of Security Office 21. To pick up our spirits with no less brutality, that afternoon we took a tuk-tuk to the outskirts of town to attend a Cambodian boxing match. Admission was free and two apparently famous boxers were headlining the match, so needless to say, it was packed. We started by pushing our way through the crowd in order just to see the ring from afar. To our surprise, the first match was two female fighters. Cambodian boxing is extremely similar to Muay Thai (Thai boxing) in that they use a lot of kicks and elbows in addition to punches. The two girls fought hard and everyone seemed to be into it. Our original view at the boxing arena. Just when I thought I found the perfect vantage point on the floor, we found out that in Cambodia they like to welcome Westerners with even more hospitality than we were already used to. We were taken right up on to the stage to sit in nice couches with the best view of the ring. Apparently, all westerners are automatically VIPs and get special treatment so that we have a good time and spend money. It worked. We had an absolute blast. I took tons of pictures, we got to witness a great match, and I also got to adorn the fighter with a necklace of roses before his match. 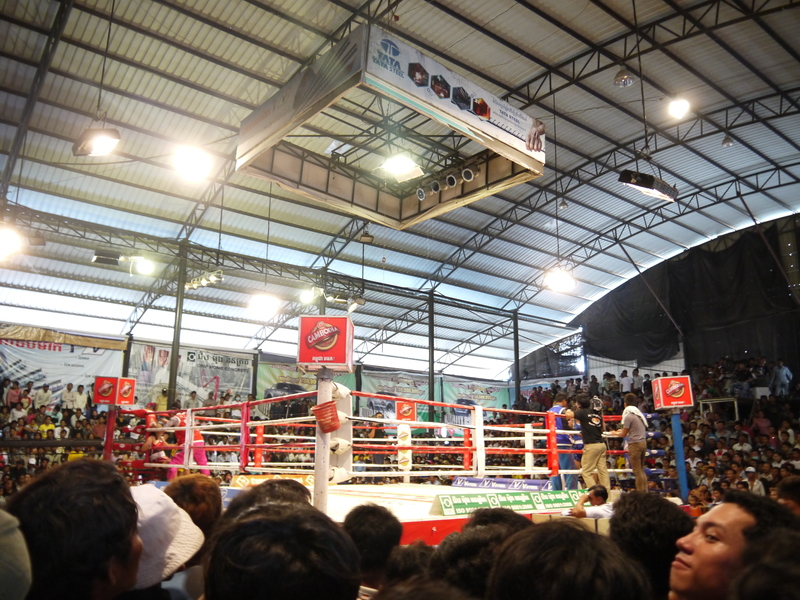 It was all very surreal to be in a boxing ring on Cambodian TV, but that’s just a Sunday afternoon in Phnom Penh!